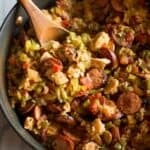 This Chicken and Sausage Jambalaya dinner is healthy comfort food that is made in just one pan! In a large skillet with a fitted lid, add the oil over medium high heat. Add the kielbasa and chicken and brown well, flipping once or twice to brown on all sides. Remove to a plate. (The chicken doesn't need to be cooked all the way through). Add butter and flour to the pan and stir well, scraping up any leftover browned bits from the pan. Add onion, garlic, celery, and bell peppers and saute for a few minutes. Add basil, cajun seasoning, diced tomatoes and sugar and stir well to combine. Simmer for 1-2 minutes. Add chicken broth, rice, and reserved meat. Bring mixture to a boil. Reduce heat, cover pan with fitted lid and cook for about 20-25 minutes or until water is absorbed and rice is tender. Remove from heat, stir gently just to toss, and then allow to cool for 5 minutes before serving. *I usually use Polska Kielbasa sausage because it's less spicy for my kids.